The Women Entrepreneurs Platform (WEP) of the NITI Aayog on June 27, 2018 signed five separate Statements of Intent (SoIs) with financial institutions and social organizations. These organisations are Shri Mahila Sewa Sahakari Bank Limited, Indiabulls Housing Finance Limited, SREI Infrastructure Finance Limited, Sreemanta Sankar Mission and Self Employed Women’s Association (SEWA). The SoIs signed with financial institutions such as the Shri Mahila Sewa Sahakari Bank, Indiabulls Housing Finance and SREI Infrastructure Finance will be included under the WEP-Finance vertical. These SoIs will provide financial assistance to women entrepreneurs and address the finance related challenges. The WEP is an initiative under the NITI Aayog which was launched on March 8, 2018 on the occasion of the International Women’s Day. The idea of the Platform was first mooted by Amitabh Kant, CEO, NITI Aayog, who announced the setting-up of a Women Entrepreneurship Platform in NITI Aayog at the conclusion of the 8th Global Entrepreneurship Summit (GES) held in Hyderabad in 2017. The Women Entrepreneurs Platform was established to substantially increase the number of women entrepreneurs who will create and empower a dynamic New India. The Bharatiya Janata Party-ruled Arunachal Pradesh may lift a 40-year-old anti-conversion law to uphold secularism. 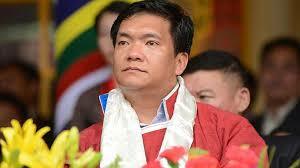 Chief Minister Pema Khandu said his government could repeal the Arunachal Pradesh Freedom of Religion Act, an anti-conversion law, that the frontier State’s Assembly has passed in 1978 primarily to check proselytisation. Uttarakhand enacted a similar law in May this year. Arunachal was the third State after Odisha (1967) and Madhya Pradesh (1968) to enact an anti-conversion law. Chhattisgarh in 2000, Gujarat in 2003, Himachal Pradesh in 2007 and Rajasthan in 2008 also passed anti-conversion laws, prohibiting forced or money-induced conversions. On June 27 every year, the International Micro, Small and Medium-sized Enterprises (MSME) Day is observed across the world. This year is second edition after the day was instituted in April 2017. The day highlights strong contribution of MSME businesses worldwide to livelihoods, communities and economies, and need to support MSMEs towards their success. Objectives of this day are to advocate importance of MSMEs in youth employment, raise awareness around the skills needed by youth to acquire decent jobs and raise awareness around youth entrepreneurship. “The Youth Dimension” is the campaign slogan of MSME Day 2018. The Union Cabinet has approved Implementing Arrangement (IA) between India and France for pre-formulation studies of Maritime Domain Awareness Mission signed in March 2018. The proposed joint mission will be devoted to maritime domain awareness, with objective to provide relevant data and services to both nations. The monitoring system will provide end to end solution for detection, identification, monitoring of vessels in the regions of interest for India and France. As per the IA, Indian Space Research Organization (ISRO) and France’s Centre Nationale Dètudes Spatiales (CNES) will jointly undertake various activities during these pre-formulation studies. On June 28, 2018 the Union Cabinet approved the MoU between India and Singapore on cooperation in the field of urban planning and development with the objective to facilitate government agencies in the Centre and States, including Municipal Bodies, to readily tap into the expertise of Singapore agencies in the areas of urban development and management and other areas. Under this MOU, capacity building programme in the field of planning, and waste water management, solid waste management, Intelligent Transport System and public financing would be undertaken. The Union Cabinet chaired by the Prime Minister Narendra Modi approved signing of the Memorandum of Understanding (MoU) titled Joint Declaration of Intent between India and Germany on Cooperation in the field of Civil Aviation that will lead to promotion of safe, effective and efficient development of air transport between India and Germany. This MoU signifies an important landmark in the civil aviation relations between India and Germany, and has the potential to spur greater trade, investment, tourism between the two countries. The Union Cabinet approved the agreement between India and Denmark on Cooperation in the field of Science, Technology and Innovation with the objective to encourage, develop and facilitate cooperation between India and Denmark in fields of common interest within Science, Technology and Innovation. Renewable energy, water, material science, affordable healthcare, synthetic biology, functional food, and blue economy were identified as potential areas for immediate collaboration. The Union Cabinet approved the signing of a Memorandum of Understanding (MoU) between India and Bahrain on cooperation in the field of Healthcare. The MoU covers exchange of information including publications and research outcomes; encourages health and medical research activities at both the private-sector and the academic level. A Working Group will be set up to further elaborate the details of cooperation and to oversee the implementation of this MoU. The Cabinet Committee on Economic Affairs (CCEA) has approved the capital infusion of Rs. 2000 crore for strengthening of Export Credit Guarantee Corporation (ECGC) to enhance insurance coverage to micro, small medium enterprises (MSMEs) exports. The amount will be infused in three financial years i.e. Rs.50 crore in 2017-18, Rs.1450 crore in 2018-19 and Rs.500 crore in 2019-20. With enhanced capital, ECGC’s underwriting capacity and risk to capital ratio will improve considerably. The Union Ministry of Health and Family Welfare has banned manufacture and sale of Oxytocin drug formulations for domestic use in private sector to prevent its misuse from 1st July 2018. Its import also has been banned. It also has not allowed retail or wholesale chemists to stock this drug in their shops in any form or name. Henceforth, Karnataka Antibiotics & Pharmaceuticals Ltd will only manufacture the drug and supply it directly to registered private and public hospitals. Oxytocin has become controversial hormonal injection that is misused widely in the dairy industry, agriculture and horticulture. President Ram Nath Kovind launched Solar Charkha Mission under which Government will disburse subsidy of Rs 550 crore to thousands of artisans, generating employment in rural areas. It was launched during the event of Udyam Sangam (National MSME Conclave) on the occasion of World MSME Day observed on June 27. Under this mission, Ministry of Micro Small and Medium Enterprise (MSME) will cover 50 clusters across the country including in the Northeast and each cluster will employ 400 to 2,000 artisans. Its ultimate aim is to generate employment in rural areas and contribute to the green economy. The mission is expected to create one lakh jobs during the first two years. The Union Cabinet has approved establishment of additional 6.5 Million Metric Tonne (MMT) Strategic Petroleum Reserves (SPR) facilities at Chandikhol in Odisha and Padur in Karnataka with capacities of 4 MMT and 2.5 MMT respectively. It also approved construction of dedicated SPMs (Single Point Mooring) for the two SPRs. This decision is in line with Government’s announcement of setting up of two additional SPRs during 2017-18 budget. These facilities will provide an additional supply of about 12 days of petroleum reserves and is expected to augment India’s energy security. They will be built up project under Public Private Partnership (PPP) model to reduce budgetary support of Government of India. 1. Which among the following states is the first to enact anti-conversion law? 2. When is the International Micro, Small and Medium-sized Enterprises (MSME) Day is observed across the world? 3. With which of the following countries India approved Implementing Arrangement (IA) for pre-formulation studies of Maritime Domain Awareness Mission signed in March 2018? 4. What was the agreement signed between India and Denmark about? 5. Who will manufacture Oxytocin after its ban by the Union Ministry of Health and Family Welfare? Kerala Antibiotics and Pharmaceuticals Ltd.
Maharashtra Antibiotics & Pharmaceuticals Ltd.
6. What is the aim of the "Solar Charkha Mission" launched by President RamNath Kovind? 7. How many metric tonnes of SPR facilities is to be established as approved by the Union Cabinet?